Andhra Bank Recruitment 2017 for filling the Sub Staff Posts/Andhra Bank Sub Staff Posts recruitment 2017/ Andhra Bank Recruitment Application form, Last date to apply for Sub Staff Posts in Andhra Bank. 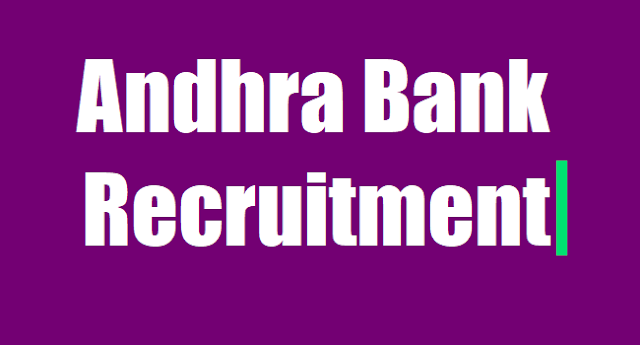 Andhra Bank, Mumbai has published notification for the recruitment of Sub Staff vacancies. Eligible candidates may apply in prescribed application format on or before 24-05-2017. Other details like age limit, educational qualification & how to apply are given below…. Candidates age limit should be between 18 – 25 years as on date of notification. Age relaxation is applicable to 05 years for SC/ ST candidates, 03 years for OBC candidates & 10 years for PWD Candidates. For more relaxation details refer the notification. Candidates should have Pass in 10th Standard or its equivalent irrespective of the Board with local language as one of the subjects in 10th Class & basic reading/ writing knowledge of English and local language of the concerned State & not have passed Graduation or its equivalent. Eligible candidates may send their application in prescribed format with all attested copies of certificates in support of age, qualification along with Transfer Certificate/ School Leaving Certificate from the Institution last studied, caste, place of domicile, Disability etc to the Zonal Manager, Andhra Bank, HR Department, Zonal office on or before 24-05-2017. Last Date for Receipt of Application: 24-05-2017.